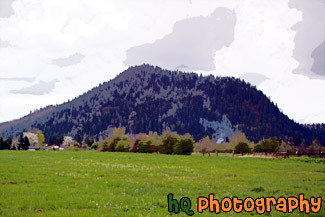 A scenic picture taken of the local small mountain in which people of the area hike up to receive and excellent workout. This picture was taken on a cloudy day in Enumclaw, Washington. A green grass field is seen in the foreground and a little bit of smoke is seen just before the mountain.